We got CJ(my 3 yr old daughter) a play kitchen during Thanksgiving sale last year(2009). It has been one of her favorite toy! She not only plays pretend cooking, She also likes to take orders and serves us the food. I realized she needed an apron when she wanted to wear my apron. I promised her I will make one of her size. Finally after a long wait(almost a year) I made her an apron. 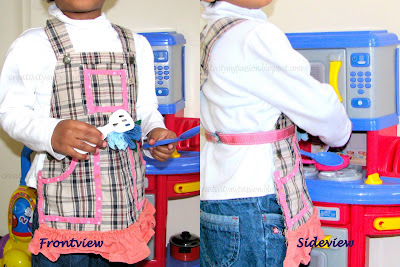 In an effort to reuse and recycle some of her outgrown dresses, I refashioned her shortall to an apron. In the front I kept the fasteners as they were. On the backside of the shorall I cut a V-shape at the joining place of the fasteners as shown below. I gave the below simple version to my daughter. The expression on her face showed it was too boring. Needed some extra trim. 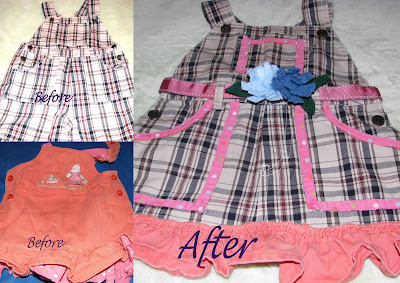 I used Aleene's Fabric Fusion Permanent Adhesive to glue the fabrics and frill to the apron. Made a flowery fabric belt to go with her apron. I liked the way it turned out. CJ was also super excited when she saw the frilly, flowery apron. She smiled and said this one is perfect for me, just the way I want. Hi Esther, Love your projects... will love to try these out some day... though I am hopeless when it comes to stitching...!! do refer makeitandloveit.blogspot.com ... The blog has similar lovely ideas ...!!! This is a cute idea!! Now I wish I had kid shortalls to convert :) Thanks for your comment over at You Seriously Made that! Great tutorial. What a great use of all shortalls. Thanks so much for visiting my blog and your kind comments. Joined the party over at "To Sew With Love" and saw your link there...WOW! What a clever, creative, and beautifully done re-purpose of shortalls! I love all your details, and am feeling inspired to make one for my little niece! i totally dig this repurposing project! lovely apron! thanks for linking up at our crafty saturday party! we will be featuring your project tomorrow! can't wait what you have for next week!